I was parked behind Whiskey Pete's in Primm on the CA/NV border, far enough from the noise and lights of the Interstate and casinos to sleep peacefully. A text arrived around 5a to wake me up and notify me of Bob's arrival. He had driven from Hawthorne during the night, arriving earlier than expected, around 4a. He'd breakfasted at the iHop before texting me at our arranged meeting time. My terse directions proved insufficient for Bob to locate the open gate at the back of the casino which provides access to the backcountry north of the highway. After dressing, I drove back out to the gate and we eventually found each other driving around the mostly quiet parking lot. We consolidated our gear into Bob's Liberty, left the van at Whiskey Pete's and headed back out through the gate and north on one of the BLM roads heading north. Our goal today was the highpoint of the Stateline Wilderness located just inside the CA border. Road conditions were suitable for the high-clearance Liberty until we came to a rough washout just short of the 4mi mark. It was not a significant setback, however, getting us within two miles of the highpoint - much better than the longer hike I would have had from Primm if Bob hadn't joined me. The sun had just risen as we set out on foot shortly after 6a, heading directly across the desert floor in a westerly direction. The mile-long hike over easy terrain gave us plenty of time to pick out a route up the mountain from the east side. We settled on what might be termed the East Ridge, a serpentine line that made for a good class 2 ascent route leading fairly directly to the summit. Climbing through the chilled morning air, we found a stiff, cold wind blowing over the summit ridge when we reached it. We scrambled to the summit, having taken about an hour and a half, then ducked down on the leeward side to get out of the wind. We found two registers among the summit rocks. Sue and Vic Henney had left one early in 2015, evidently not finding one left by Dennis Poulin a year earlier. Dennis noted his as "First known ascent" but in fact Gordon MacLeod has recorded an ascent on LoJ from 30yrs earlier. If Gordon had left a record of his ascent on the summit, we were unable to find it. Thanks to the close approach via driving, it had not taken us long to reach the summit and to me, at least, it seemed a small shame to simply head back and call it done. I had originally planned a three peak tour, adding a couple of lower summits north and south of the highpoint. I mentioned the first summit to the south when we started out but Bob expressed no interest and we simply continued to the highpoint. Now that we were on the summit I worked on my persuasive skills a second time, suggesting Peak 4,586ft to the north would give us a nice little tour. Bob wasn't hot on the idea, but liked that it would enable us to make better use of the old road after descending. Reluctantly he agreed, reserving the right to complain as much as he deemed appropriate. I thought the next half hour off the highpoint heading north to be the best part of the day, with some pretty nice class 3 scrambling, including a few short tough sections where Bob felt it suitable to complain. With some coaching and encouragement he made it down the toughest of these, eventually landing us on easier ground along the crest. We continued along the ridgeline, until coming to a point at its north end. Bob chose to contour around its east side while I went up and over the top, the two of us meeting again on the descent to the saddle with Peak 4,586ft. From the saddle we climbed about 400ft to reach the highpoint around 9:20a. A collapsed wooden survey tower was found on the summit and I took a few minutes to set it back up while Bob sat for a short rest. We descended southeast and east off the summit, following a meandering ridgeline with many forking ridges, all of which would work nicely at no more than class 2. Reaching the desert floor shortly before 10a, we found the old road that used to run over Stateline Pass to the north. It was poorly situated in the floodplain and washouts eventually rendered it useless for vehicles. A newer version is found on higher ground to the east, though as we found earlier, even that is subject to errant washouts. We followed the old road for about a mile and a half back to the Liberty, finishing around 10:30a. We drove back towards Primm, turning west on a dirt powerline road which we drove for more than 9mi to Keany Pass. Keany BM and the wilderness HP are both found less than a mile to the north, above the pass. It took us just over an hour for the leisurely roundtrip hike to both points. The slightly lower wilderness HP held a John Vitz register placed earlier in the year. It was not a very fulfilling effort and we still had four hours of daylight by the time we finished. We drove back to Primm and stopped at the Starbucks there for some Wifi to look for another afternoon peak to keep us entertained. Our original plan was to head west for Club Peak and other options, but we'd forgotten about the LA exodus from Las Vegas that occurs on Sunday afternoon causing heavy traffic in that direction. 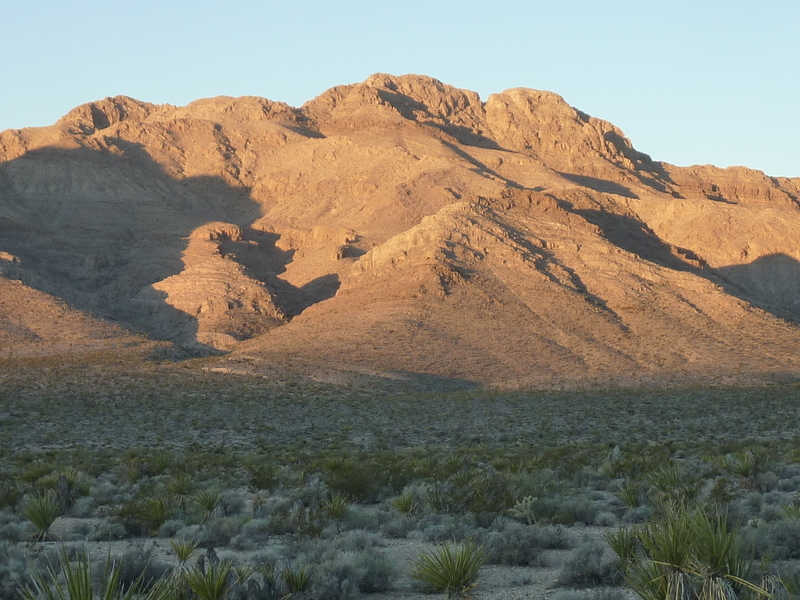 Instead, we settled on the highpoint of the Bird Spring Range and headed northeast to Jean and then northwest to the even smaller town of Goodsprings. From there we followed dirt roads north and east to the base of the mountain, getting within 3/4mi of the summit. This might have been another ho-hum hike (a very steep dirt road goes to the top) had it not been for the 4x4 enthusiasts that provided us with fine entertainment. The club comprised about 10 Jeeps of various capabilities. They were lined up on the road halfway up the mountain in order to take the steepest part one by one. We watched one vehicle give up on the loose dirt slope, others faring better. The real entertainment was the poor guy who had slipped partly off the road and had gotten himself stuck. As we passed by on foot, he and another were busy with shovels trying to get the back end unstuck. Later on the way down they would be rigging up winch cables to tow him out from high above. We chatted with the friendly folks that mostly consisted of middle-aged folks, with both male and female drivers and not a few small family members, too. At the summit we found a Gordon/Barbara register from 1993 that had many entries, mostly from the motorized crowd that use this as a test piece of sorts. On our drive back out to Goodsprings we came across a small herd of wild horses roaming Goodsprings Valley in search of better grass (or perhaps handouts).